You are holding a unique old Slavic game, which has a long, rich history and has had many incarnations in various cultures across the world. This game was invented by the forebearers of ancient Slavic tribes who lived in Kievan Rus. 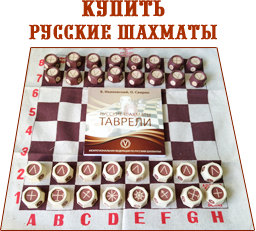 Archaeological finds provide scientific evidence that by the 9th-10th centuries A.D., Slavs played the game of tavrels, an early predecessor of the modern game of Russian chess. 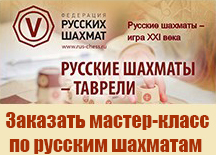 Below you will find information about the rules of Russian chess and become introduced to the basics of the oldest intellectual game. Fig.1. 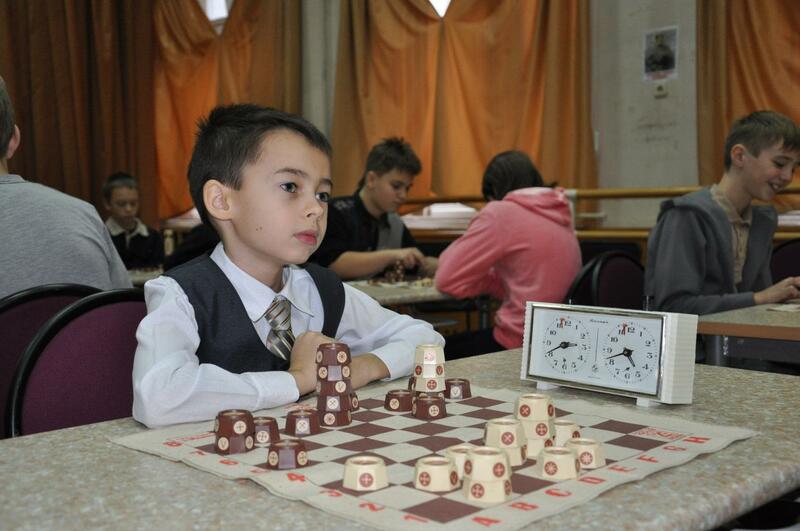 Young chess players play Russian chess. a) Labels with dark backgrounds should be applied to the light colored pieces, which are referred to as “white”, and labels with light backgrounds should be applied to the dark brown pieces, which are referred to as “black”. 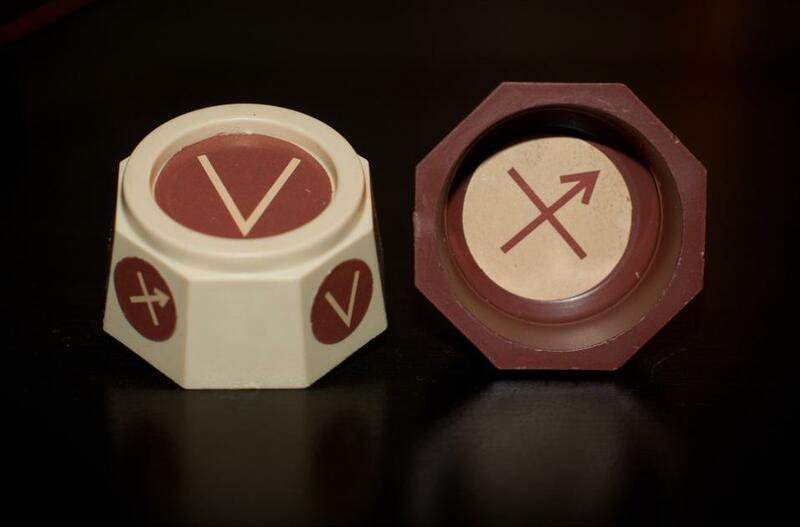 b) The bigger labels with identifying symbols (two Warriors, two Horsemen, two Archers, one Prince, and one Wizard per player) should be affixed to the top of the pieces. 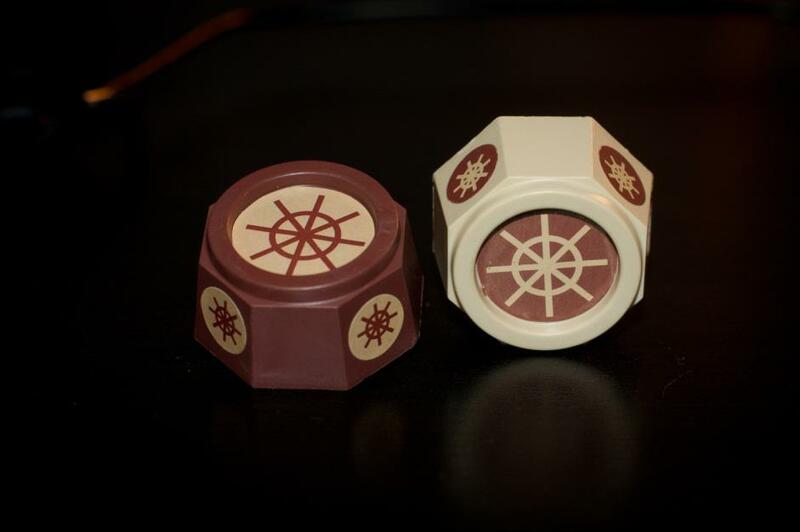 The smaller labels go on the sides (each piece will have 4 small labels, one on every other side) (See Fig. 2). Fig. 3. Labels properly affixed to the Combatant piece that is positioned in front of an Archer (note the Archer label on the bottom of the piece). The game is played by two players who take turns moving the pieces, called tavrels, across a chessboard’s squares. The chessboard has 64 squares, eight horizontal rows, called ranks, and eight vertical columns, called files. 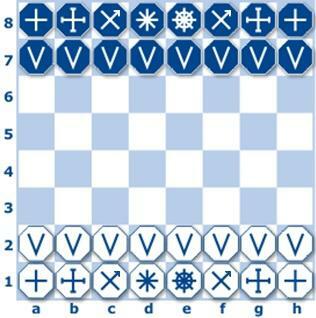 The chessboard also features dark (called “black”) and light (called “white”) diagonals of squares (Fig. 4). Every player gets 16 pieces called tavrels. To place the opponent’s Wizard in a position that prevents the opponent from protecting the Wizard against “capture” (being made part of a tower) in the next move. In this situation, the player is considered to have checkmated the opponent’s Wizard and won the game. The opponent whose Wizard has been checkmated loses the game. The game can also end in a draw or a player may resign. A move is a tavrel’s movement (as a single piece or as a part of a tower in accordance with the rules of movement for the tavrel on the top) from one square to another. Except for the Helgi (when it moves like an Archer), the Wizard and Horseman, and a Warrior when castling, no piece can jump over a square occupied by an opponent’s piece. Note: Pieces are not removed from the board during play. Instead they may become part of a tower. Any tavrel may be placed atop another tavrel(s) (the player’s own or his opponent’s), thus forming a tower. There is no limit to the number of tavrels that may be in a tower. Exception: No tavrel may be placed atop a Wizard (see Check and Checkmate). But a Wizard may be placed atop other tavrels. An entire tower may be moved or it can be divided into two parts. If a player decides to separate a tower, the player’s first move will be made using the top portion of the tower, which will move in keeping with the rules of movement for the top tavrel. The tower’s lower portion will remain in place for that move, and thereafter it will move in accordance with the rules of movement for the tavrel on its top. If the Wizard is not under attack and open to capture by the opponent’s tavrels (i.e., not in a position where in the next move it could be added to an opposing tower), it can move one square in any direction. The Wizard can form a tower if it is not under attack and open to capture. The Warrior moves horizontally or vertically to any square. It cannot “jump over” tavrels, except in castling. If a player’s own tavrel or the opponent’s tavrel stands in the Warrior’s way, the Warrior is put on top of that tavrel, forming a tower that will move according to the rules of the top tavrel. The Archer moves diagonally to any available square. The Prince can move to any square vertically, horizontally, or diagonally. He can move like the Archer and the Warrior. It is one of the strongest pieces, second only to the Helgi. The Horseman is a very special piece. Other tavrels can only move straight horizontally, vertically, or diagonally, while a Horseman moves two squares horizontally then one square vertically or one square horizontally then two squares vertically. In addition, the Horseman is not blocked by other tavrels; it can jump over a player’s own or an opponent’s tavrels. Its moves form a sort of L-shape. The Combatant moves one square vertically straight ahead, but it cannot move if that square is occupied by an opponent’s tavrel. Only in its initial move may a Combatant move two squares vertically straight ahead, if those squares are not occupied by the opponent’s tavrels. If the squares are occupied by the player’s own tavrels, the Combatant can form a tower with them and is put on top. A Combatant that crossed the chessboard and has been returned to the square it occupied at the beginning of the game—on horizontal ranks 2 and 7, for whites and blacks, respectively—may only move one square per move (not two squares, as in its initially move). If a Combatant moves to a square where an opponent’s tavrel is on either of the two spaces adjacent to the space in front of it (i.e., either of the two squares diagonally in front of the Combatant), the Combatant can be put on top of that tavrel and become the top of a tower. When a Combatant reaches the horizontal rank farthest from its starting position, it is turned upside down and becomes a tavrel like the one it stood in front of at the beginning of the game and whose symbol is on its bottom and sides. This transformation is considered part of the same move. If a Combatant that is part of a tower crosses the chessboard and reaches the farthest horizontal rank, it can be transformed into the tavrel it stood before at the beginning only if it is the only piece on that square or it is the top tavrel in the tower that reaches that position. Note that the Combatant that was initially placed in front of the Wizard turns into a Helgi. If the player’s own tavrel or the opponent’s tavrel is put on top a Combatant that has been transformed into the one it stood before at the start of the game, that Combatant is turned right side up and reverts to an ordinary Combatant. Helgi may move vertically, horizontally or diagonally to any available square, or it may move like the Horseman. Thus, the move capabilities of a Helgi match the Prince’s and the Horseman’s capabilities combined. This is the strongest piece in Russian chess. Helgi can checkmate the opponent’s Wizard without the help of other pieces. Castling is permitted once per player during a game. Castling can be long or short. Castling is performed as follows: the Wizard jumps over one square towards a Warrior, and then the Warrior is placed on the opposite side of the Wizard, next to it. Castling is not permitted if the Wizard and that Warrior have already moved. When castling, the Wizard must be touched first, then the Warrior. If a player who wants to castle touches both the Wizard and a Warrior at the same time, castling in that direction is prohibited – the player must castle in a different direction, if possible, or move the Wizard. If the Wizard cannot move, the player is free to make any legal move. -Another tavrel is on the same horizontal rank as the Wizard and the Warrior involved in the castling. If a Combatant that is moving two squares in its initial move passes over a square that is under attack by an opponent’s tavrel (i.e., an opponent’s tavrel could capture the Combatant were it to move only one, not two squares), that Combatant can be captured and become part of a tower. If any of the tavrels – Prince, Warrior, Archer, Horseman, Combatant, or Helgi – attacks a Wizard, this attack is called “check”. Check must be avoided. There are three forms of defense: the Wizard is moved away from the attacking tavrel, the attacking tavrel may be captured (become part of a tower), or another tavrel may be placed between the attacking tavrel and the Wizard. If none of the moves protecting against check (moving the Wizard to safety, capturing the attacking tavrel—adding it to a tower—or blocking the Wizard with another tavrel) can be accomplished, the Wizard is checkmated. The game ends and the player whose Wizard has been checkmated loses. The game is won if the opponent’s Wizard is checkmated or the opponent resigns voluntarily. 3. If the capabilities of the tavrels have not changed and one of the players finds himself in the same position three times (not necessarily in a row), he may call a draw. One of the varieties of such a draw is a perpetual check, when one of the parties continuously attacks his opponent’s Wizard and the latter cannot shield himself from checks. The following notation is used for recording individual moves or entire games: horizontal rows, called ranks, starting from the position of the white player, are denoted by numbers 1 to 8, and vertical columns, called files, from left to right, starting from the position of the white player, are denoted by the Latin letters a, b, c, d, e, f, g, h.
Any square on the chessboard is identified first with the letter for the corresponding vertical file and then the number for the corresponding horizontal rank. Each move of a tavrel is recorded as a combination of two squares (with a hyphen in between), denoting the square where the tavrel in question was and the one where it moved. 1. If a player whose turn it is deliberately touches one or more tavrels on the chessboard, he must move the tavrel that was touched first, if it can be moved. If a player wishes to adjust the position of one or more tavrels (or towers) on their squares, he must first announce it (e.g., by saying, “I’m adjusting the tavrels.”). 2. If a player deliberately touches first a Warrior and then the Wizard, castling is not allowed. When castling, the Wizard must be touched first. If a player who wants to castle touches both the Wizard and a Warrior, castling in this direction is prohibited – the player must castle in a different direction, if possible, or move the Wizard. If the Wizard cannot move, the player is free to make any possible move. 3. If none of the touched tavrels can move, the player may make another move. 4. If a player’s opponent violates points 2 or 3 above, the player cannot make a statement about it if he has deliberately touched a tavrel. If a tavrel is positioned as a possible move or as a part of a possible move, it cannot subsequently move to a different square.